I’m glad you picked this reading plan on fasting like Daniel. Honestly, I’m no fasting expert. I don’t even like to fast! But the Daniel Fast has been a revolutionary part of my life for over 10 years and has helped draw me closer to God and experience incredible breakthroughs. You may have never fasted before. That’s OK. I hadn’t really connected with fasting either, with a fast here, a fast there—and no spiritual renewal anywhere. That changed just over 10 years ago. A rather charismatic member of my team while I was a campus pastor for Life.Church introduced the Daniel Fast, and we did it as a team. It was nothing short of amazing! My family has participated in a Daniel Fast each year since, and each year it has helped us feel renewed spiritually, connect with God, and see incredible breakthroughs. I can’t promise you will have the exact same experience. But I will tell you this: no one I know who has participated in the fast and connected with God on a deeper level hasn't seen something positive in their lives. Denying yourself, connecting to God, praying, reading your Scripture, and applying what you are learning and what God is saying will always bear positive fruit! Today’s reading introduces Daniel, the original Daniel faster. Daniel and the other leading young people of Israel were taken captive to Babylon when they were only teenagers. How do you think you would handle being taken far from your home, your family, and your value system and indoctrinated into the foreign culture of the most exciting, sophisticated—and ungodly—country in the world? I don’t know how I would’ve done, but Daniel and his friends were HUNGRIER FOR GOD than they were for the “choice foods” on the king’s table. They chose to reject the bounties of Babylon to instead receive the blessings of God. We can choose this, too. When we do, we will see God’s transformation process at work, producing things like love, joy, peace, patience, kindness, goodness, and self-control in us. Check out www.fastlikedaniel.com for details about the Daniel Fast, resources like our Companion Guide full of awesome recipes, tips, ideas, and to learn more about how you can add this spiritual discipline to your life to make more room for God. 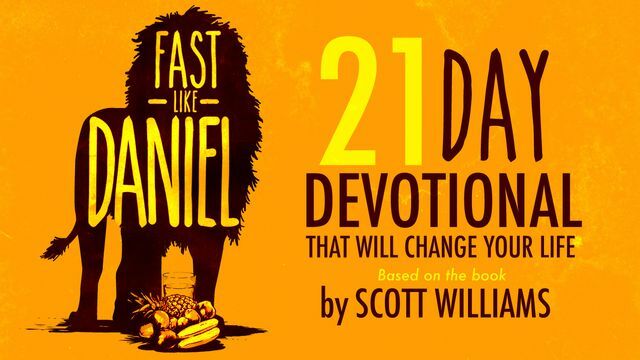 You can also pick up a copy of the comprehensive Fast Like Daniel devotional.